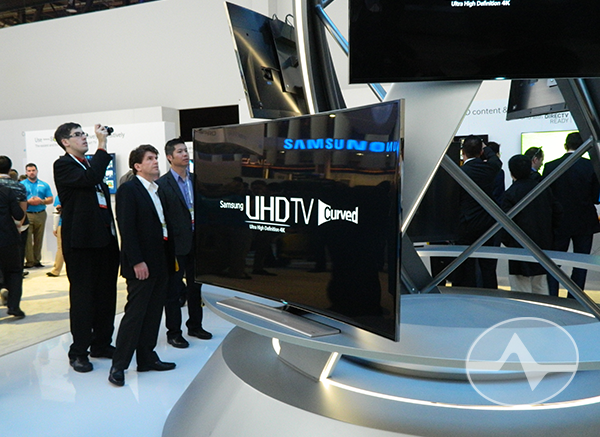 Anyone who’s anyone at this year’s International Consumer Electronics Show showed a curved TV. There were big ones, small ones… more curves that an (insert inappropriate comment here.) But as our blog team walked the room, we talked amongst ourselves and also to the folks we met, and there’s one conclusion: No one wants a curved TV. Having spent some time with them, there’s just no benefit. The theory is that you get a better viewing experience but unless you are talking about 150″ screen you have to sit uncomfortably close to the TV before you see any distortion from a flat TV. No one is going to sit two feet away from a 55″ TV and that’s what it would take to get the benefit of a curved screen. So, other than the obvious “gimmick” factor, what’s up with curved TVs? There’s a little secret that seems to apply to every one of those curved TVs (except LG’s prototype OLED). It turns out they are pretty thick and pretty heavy. That’s right, the average curved TV is about as thick as a 2008-era flat TV. There just isn’t this super-thin aspect to most of them. The ones that are super-thin aren’t headed to production anyway. This sets the entire thing in a different light. Most likely it doesn’t cost a whole lot more to make a curved screen, and so manufacturers are actually saving money by making thicker TVs… for which they want to charge you more! Don’t get sucked in by the hype. Curved TVs don’t give you any more quality and they don’t really help you see more clearly. They keep you from hanging the TV on the wall (unless you have a serious desire to bean your head up against a TV that sticks out a foot or so) and they make it easier for TV makers to give you a thicker TV that costs more. On the other hand, there is a potential use for curved TV technology and it’s in huge monitors. If you are trying to replace six regular-sized monitors with one huge 4K or even 8K monitor, you’ll no doubt be close enough to need a curved TV to help with your viewing angles. So, maybe, if we’re lucky, we’ll see that technology flower even as curved TVs wilt.